These print media campaigns have been specifically designed to reduce misperceptions of student norms and thereby reduce levels of alcohol and other drug use and the resulting consequences. Examples of products produced are displayed here. 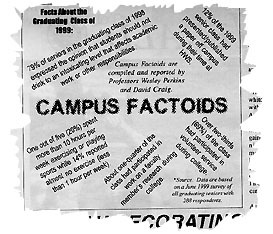 Campus Factoids- "Campus Factoids" is a weekly column that appears in the Hobart and William Smith Colleges student newspaper "The Herald". The column reports the characteristics and accomplishments of the student body along with facts and data about student drinking norms. Newspaper and Poster Ads- These advertisement campaigns report alcohol norms to the campus community. Specifically, two examples are the "Silent Numbers" and "Reality Check" campaigns. These advertisement posters were posted around campus and appeared in the HWS student newspaper "The Herald".